The Concours d’Elegance de l’Internet is a motorcycle photography competition inspired by the iconic pictures of characters such as Georg Meier and Steve McQueen riding their BMWs and Triumphs to glory. It combines our passions for motorcycles, photography and travel. 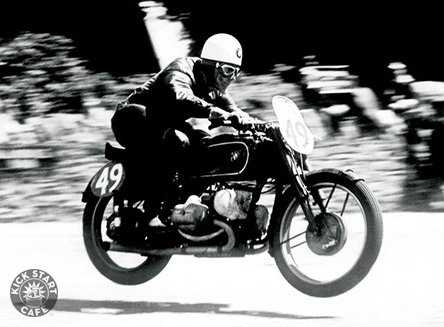 Photo courtesy BMW Group Georg Meier on a BMW RS 255 during the 1939 Isle of Man Senior Tourist Trophy. 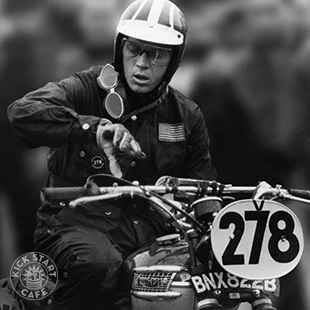 Photo courtesy FIM Steve McQueen on a Triumph Trophy during the 1964 International Six Days Trial in Germany. Entries may be submitted to motophoto@kickstartcafe.com. Please include captions with the who, what, where, when and why. And credit the photographer. Entries are accepted year round and posted to our website and Facebook page as they arrive. Depending on the volume and quality of the entries, they may be pre-screened by the curator. Entries will be judged for the quality of the motorcycle, the quality of the photograph, and context. A nice picture of you setting a land speed record on your dad’s old Vincent at the Bonneville Salt Flats would be a contender. Quarterly, a People’s Choice Award will be given to the entry that receives the most Likes on our website and Facebook page. A Grand Prix winner will also be selected each quarter by a guest expert judge. Each winner will receive a limited-edition Kick Start Cafe t-shirt and whatever other swag we can come up with. As you can see from our journal, we prefer pictures of original-condition, vintage, European motorcycles being ridden by interesting ladies and gentleman in exotic locations. So grab your camera, jump on your bike and go on an adventure. We look forward to seeing the pictures you bring back. Cheers. Concours d'Elegance: A French phrase meaning a concourse of elegance dating back to the 17th Century when the French aristocracy paraded horse-drawn carriages in the parks of Paris.